Monitor your event logs and be alerted to critical messages. The ipSentry Event Log Monitor Add-In provides you with the ability to monitor various event logs such as Application, Security, System, DNS, Active Directory, and others for specific event log entries to which you want to be notified. When the event information you have selected is detected, the alerts configured in ipSentry can be triggered. This add-in allows you to specify the event log, event source, event type, and other event specific information to be applied to the filter. The latest release allows you to select how many occurrences of the event must be found within a specified amount of time in order to trigger alerts..
Scan your local and remote event logs for entries too which you want to be alerted day and night. Event messages like account lockouts, login failures, application errors, system errors, the list goes on. Only you know what events keep popping up in your logs that are a precursor to a failure of one sort or another. We go a step further than just looking for an event. 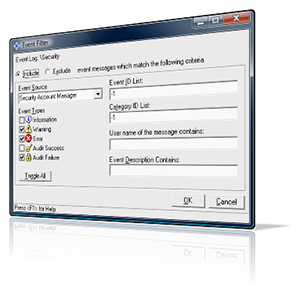 With the Event Log Monitoring Add-in, you can be alerted to a single event, a specific number of events within a time frame, include and exclude events in the filter, be notified whether the events are or are not found within a time frame. Once the events filter is matched to trigger an alert, the details of the events can be included in your message alerts to let you know what events. ipSentry and associated add-in components are licensed as a run-time license. A single license is required to execute the ipSentry software on a single computer. There is no limitation imposed on the number of servers, workstation, devices, and etc. that can be monitored from that single installation. In situations where ipSentry must be installed and run on multiple machines for isolation, security policy, or other specific requirements, the ipSentry license packs provide built in quantity discounts for mid to heavy deployment of the software across multiple locations. From each of the installation points, the license provides for unlimited device monitoring functionality.